Who among you has not dreamed of taking part in a TV show and becoming a well-known person? Naive Lisa dreamed about the same. She is a struggling actress and she thinks this is her finest hour when she comes to casting for a new reality show. Can you guess why producers have chosen her? The main condition for participation is a lack of aptitude for agriculture. Having no idea about that this is not a sophisticated soap opera, but rather a farming reality show Lisa is signing a contract. Once on location, she discovers that this isn’t exactly her dream job she had imagined. She has no choice but to move on and complete her first tasks. The show’s producers won’t just be satisfied by making her miserable on a milking stool however, and crop up occasionally throughout the game to complicate her situation even further whenever she becomes too comfortable with her tasks. Hiring bandits to sabotage her progress at night is just one of the many tricks up their sleeves. Help Lisacome through all difficulties, playing with her. You may begin on the Casual difficulty setting, but you can unlock the Expert setting after successfully completing the first five levels. If the game’s simple story isn’t your thing, or if you’ve already played it through, you have the option of skipping over the opening story sequence. Your first mission is to plant crops and milk the cow. The first few tutorial levels do an excellent job of explaining the mechanics, and you’ll never find yourself frustrated. This lack of frustration is a major plus in a genre that sometimes feels designed to drive one crazy. There is a time limit for each level, and your degree of success is determined by your timeliness. Stacking of tasks is of course permitted so that you can continually improve your time. When you complete a level, you’re rewarded with cash, and, if you’ve done well enough, trophies. This cash can be used to buy more seeds, required machinery, and upgrades. 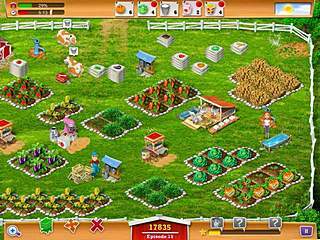 As you proceed through the levels, you’re tasked with filling customer orders with different combinations of items from your farm. Of course the number of new features is rather limited, but they are really fun and add a lot to the game. Calling helpers is tied to your show’s rating, and the rating is increased by performing the same action multiple times in a row, for example planting or watering crops and delivering products to the barn. The higher your rating, the more skilled the helper is that you may call. What also works incredibly well is the constant addition of new upgrades, crops, animals, and other features that will surprise you in nearly every level. Thus My Farm Life never seems to get repetitive or boring and it’s certainly an aspect that will please a lot of time management fans. 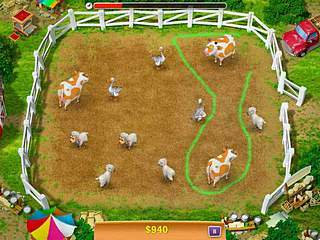 The graphics of the game are charming too, and the animations of the animals are funny to watch. The only annoying thing I found about this game is the music, even though the sounds are quite helpful as notifications, but I usually play on mute anyway, so it didn't bother me for long. 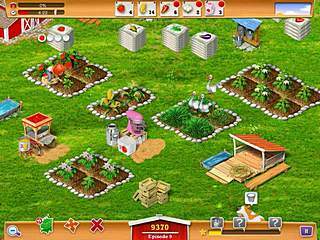 All in all My Farm Life is a very addicting game. If you are a fan of t time management games in general, definitely give this one a try. Home.a0 One overlooked senttig is your home!a0 Show off your real personalities by creating images in your natural senttig.a0 Play Scrabble at the kitchen table.a0 Bar-B-Q in the backyard.a0 Drink Latte’s on the porch.a0 Be yourself! This is My Farm Life review. Download this game here.